Early writers described the Colorado River as so silt-laden that it was “too thick to drink and too thin to plow.” In Grand Canyon these sediments formed vast sandbars and terraces, providing substrate for riparian vegetation and habitat for wildlife, as well as protecting cultural resources along the river corridor. Today Glen Canyon Dam traps the river’s sediment load, and downstream tributaries deliver the only silt. Foremost among these streams in upper Grand Canyon is the Paria River, now recognized as critically important to the health of Grand Canyon’s riparian ecosystem. The Paria River begins in southern Utah, draining high plateaus of fine-grained Mesozoic shale and sandstone. Near the Arizona border the river enters a narrow canyon of towering sandstone walls streaked with desert varnish, winding past huge amphitheaters, natural arches, wooded terraces and hanging gardens. Stunningly beautiful country, the Paria drainage offers world-class wilderness hiking. Emerging from the Vermilion Cliffs, the Paria meets the Colorado River at Lees Ferry. This is a surprisingly small perennial stream, given the enormity of its drainage basin. It is, however, capable of generating massive flash floods that deliver huge sediment loads into Grand Canyon. Samples collected from the Paria River carried the highest sediment concentrations measured in the United States: 780,000 mg/L of silt and sand – about 2 pounds of mud in a quart of water. In September 1998, a flood of 6,500 cubic feet per second (cfs) delivered about 800,000 tons of much-needed sand to the Colorado River. A much larger flood of 16,000 cfs ripped past the newly-installed gage near the confluence on October 25, 1925. Floods have been decreasing over the past few decades, probably due to upstream diversions. The vegetation of the lower Paria River consists of sparse desert riparian grass, herbs and shrubs, dominated by fescue and arrowweed, with relatively low plant cover and diversity. Extensive stands of non-native tamarisk have replaced much of the native vegetation. The only other trees along the Paria River are Fremont cottonwood, and those are sparse with low recruitment. Some evidence suggests that more extensive stands of cottonwood previously occupied the area, but were removed for fuel and construction by early Mormon settlers. The limited vegetation provides little habitat for wildlife, although quite a few species of birds inhabit the area. Bald eagles hunt along the Paria in winter, golden eagles, year-round. The red-tailed hawk, great horned owl, Cooper’s hawk, and federally endangered peregrine falcon take advantage of the riparian habitat along the river, along with various flycatchers, swallows, swifts, wrens, hummingbirds, and herons. Southwestern willow flycatcher, an endangered species, nested at the mouth of the Paria River prior to construction of Glen Canyon Dam. Bobcats, foxes, mountain lions, porcupines, beavers, and coyotes prowl throughout the rugged terrain in the Paria watershed. Prior to construction of Glen Canyon Dam, the Paria River provided important habitat for several species of fish, now federally endangered. Humpback chub, razorback sucker and possibly, bonytail chub spawned in the mouth of the Paria River. Colorado pikeminnow, another endangered fish, spent time in the mouth of the river as they migrated through Grand Canyon. Formerly a top predator in the Colorado River basin, this minnow would sometimes grow to nearly six feet long and weigh up to 80 pounds. Other native fish such as flannelmouth sucker, bluehead sucker, and speckled dace, also populate the river. By mid-summer the water temperatures can approach 100 degrees F—too hot to allow any species to exist there— a condition that was likely exacerbated by the loss of Fremont cottonwood trees and the cooling effects of their overstory shade. Petroglyphs cut into the ubiquitous desert varnish and pueblo ruins throughout the drainage provide mute testimony of early inhabitants during the twelfth century. The Dominguez/Escalante Expedition of 1776 offered the first written account of European exploration of the confluence. Many Mormon explorers and military expeditions passed through the Paria drainage before settlement began near the headwaters in 1870. The notorious John D. Lee arrived at the confluence to settle on Christmas day in 1871, and began to operate a ferry crossing on the Colorado River in 1873. Lee struggled mightily to divert water from the Paria to irrigate his land at Lonely Dell Ranch, as one earthen dam after another was washed away. The 112,000-acre Paria Canyon-Vermilion Cliffs Wilderness Area protects the wilderness character of the rugged and remote area surrounding the lower Paria River and the spectacular Vermilion Cliffs. Much of the wilderness area was incorporated into the 294,000-acre Vermilion Cliffs National Monument by President Clinton in 2000. Both are managed by the Bureau of Land Management. The 1.7 million acre Grand Staircase-Escalante National Monument, established in 1996 by President Clinton, offers some protection to the upper Paria River as well as a vast amount of the surrounding country. Administered by the Bureau of Land Management, rather than the National Park Service, the agency that manages most national monuments, much of the land is roadless and relatively unspoiled. Seventeen Wilderness Study Areas within the National Monument found to have wilderness characteristics are managed to preserve their natural conditions until the United States Congress passes wilderness legislation. The 50,430-acre Paria-Hackberry Wilderness Study Area encompasses more than 15 miles of the Paria River and surrounding terrain of multi-hued cliffs, high plateaus and narrow slot canyons. Larry Stevens and Jeri Ledbetter. Arizona Wilderness Coalition Website. Vermilion Cliffs National Monument. http://www.azwild.org/resources/factsheet_vermilion.php. 11/30/07. Energy Citations Database Website. http://www.osti.gov/energycitations/product.biblio.jsp?osti_id=7307798 11/29/07. Fish and Wildlife Service Website. Endangered Colorado River basin fish. http://www.fws.gov/coloradoriverrecovery/Crcsq.htm 12/2/08. Graf, J.B., R.H. Webb, and R. Hereford. 1991. Relation of sediment load and flood-plain formation to climatic variability, Paria River drainage basin, Utah and Arizona. Geological Society of America Bulletin 103:1405-1415. Myers, Thomas. Sediment Hydrology on the Colorado River: The Impacts of Draining Lake Powell, 1998. National Park Service Website. Lees Ferry History. http://www.nps.gov/glca/historyculture/leesferryhistory.htm 11/28/07. Rusho, W.L., and C. Gregory Crampton. Lee’s Ferry: Desert River Crossing. Tower Productions, 2003. 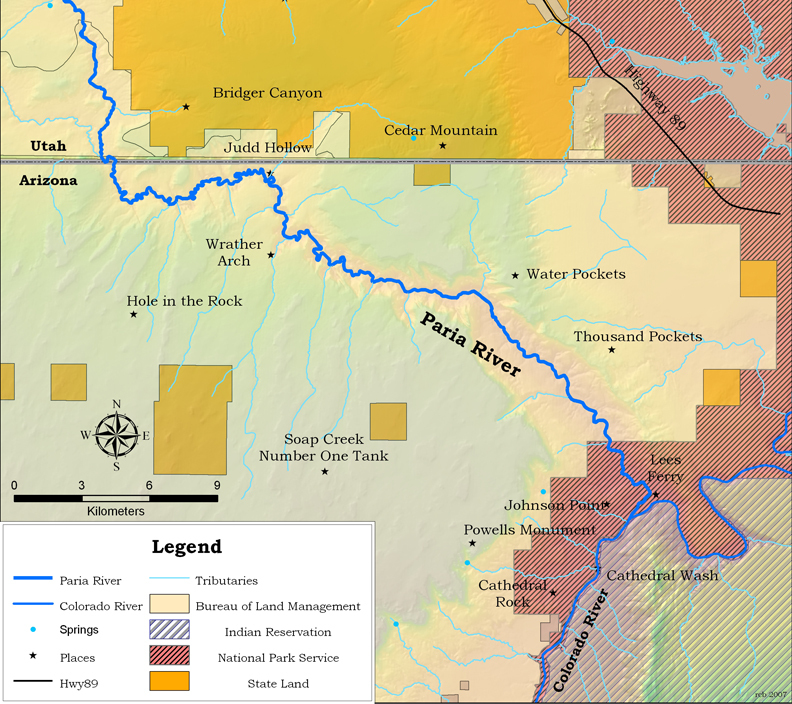 Stevens, L.E., An Ecological Assessment of 10 Water Resource Sites, Kane and Two Mile Ranches, Eastern Arizona Strip, Stevens Ecological Consulting, 2006. Webb, Robert H., Stanley A. Leake and Raymond M. Turner. The Ribbon of Green: Change in Riparian Vegetation in the Southwestern United States, University of Arizona Press, 2007.